Clean lines, sleek angles and understated button tufting defines the Scandinavian-inspired Georg Sofa. Constructed of a hardwood inner-frame, and supported by a sinuous spring system that provides ample support and comfort for up to three occupants, the Georg Sofa is ready to please. Accenting its elegant & simply-stated presence is a chic mid-century inspired microtweed fabric that outfits the Georg for any occasion and any space. The Georg's minimalist aesthetic can be traced back to mid-20th century Scandinavian influences. Its appreciation for simplicity, organic forms and for its materials were signature characteristics exhibited in the works of designers like Finn Juhl, Hans Wegner and Torben Lind. While many of the distinguished works produced by such makers remain available today at a premium, the Georg Sofa provides an iconic look at an unparalleled value. Found a great place for it in my den, I wasn't sure how it would fit in but gray works with everything! Sofa came quickly and it is wonderful quality! It looks just like the photos so no surprises there and it was even more comfortable than I imagined! this was a fantastic choice!! Been dying to get a new sofa for the past year now and I was so happy to find one that was in my price range and had the right style for my living room - i looked around for a while and i'm thrilled I made this my choice! Ultra plush cushioning and super comfy! A GREAT choice! I am really digging the way this looks in my house, it pretty much matches nicely with everything. Its comfortable and well constructed, looking forward to having it for a long time. Sturdy, comfortable, high-quality. item arrived in perfect condition and in a timely manner. Customer service was excellent. Absolutely LOVE my new sofa. I've gotten so many compliments. I wasn't sure if I should go with the light or dark grey and I spoke to customer service. I explained my decor and they suggested the dark grey. It looks awesome in my apartment. The price is as great as the couch. Happy beyond words! Next will be side tables!! make sure to measure your space first. this sofa is beautiful and such a nice piece but much smaller than I expected. How firm are the cushions? Do you sink down in the cushion at all? The Georg Sofa is going to have a firm feel, with very little sinking in the cushions. The weight capacity of the Georg Sofa is 750 lbs. The seat depth on the Georg Sofa is 22 inches. How about a microfiber fabric? At this time, this sofa is not offered in a microfiber. We use a polyester fabric which is the most requested for this sofa. Is the fabric or foam treated with fire retardant chemicals? The Georg Sofa does not contain any chemicals, VOC's or fire retardants. 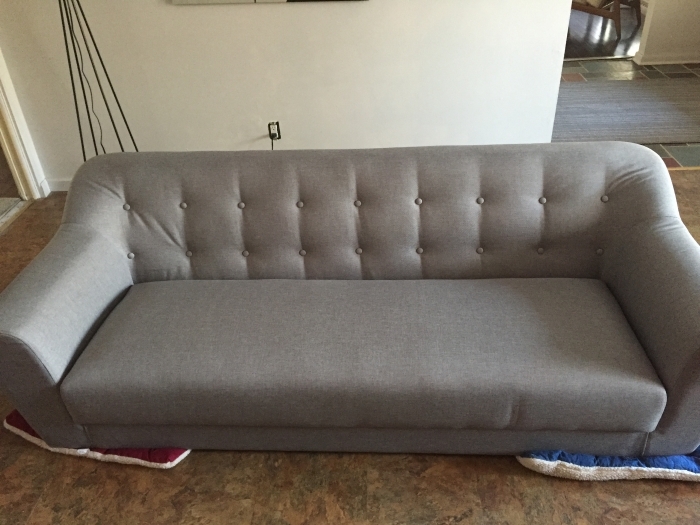 How do I clean my new Georg Sofa? A wet towel can be used for spot cleaning. Dry cleaning the sofa is also recommended. is the upholstery cotton or polyester? is it soft or itchy on the skin. The Georg Sofa is upholstered in a polyester fabric. The polyester fabric has a smooth soft feeling. Where is this sofa manufactured? Our Georg Sofa is made in a quality factory in China. I am interested in the Georg sofa. Very recently, you began offering its companion sofas, the Elaine and the Flo, in a green fabric, as well as the same shades of gray as the Georg. Do you have any intention to offer the Georg sofa in green (or any other new color) in the coming weeks? At this time August 2016, this particular sofa will be only offered in light and dark grey. We may decide down the road to begin offering more colors for this version.